I’m not going to lie. I wasn’t actually perusing the Online Etymology Dictionary just for fun. I was actually curious about the origins of the word “resolution,” especially as it came to be used to refer to personal commitments made on New Year’s Eve with expiration dates of less than thirty days. My dear friend Google sent me to http://www.etymonline.com, which promptly became one of my favorite nerdy net sites. Talk about a word that has gone through some radical reconstructive surgery. It bears no more resemblance to its original meaning than the current Kenny Rogers looks like the Gambler that I grew up with. Simpler forms? Are you kidding me? The process of making resolutions has gotten so complicated that if you search “New Years Resolutions” on Amazon.com, you will get over 20,000 book results (The most recent of which bears a book-length title itself: “New Year’s Resolutions: The Ultimate Guide to Lifestyle Design. Plug yourself into the formula of success so you can get the life you want and have a better future.” I cut and paste the title because I was afraid that re-typing it would give me carpal tunnel syndrome). There are all sorts of “rules” that I am supposed to follow, in terms of specificity, length, number, attainability, accountability, and whether they should be posted next to my bed, on my bathroom mirror, or tattooed to the inside of my eyelids. There is nothing remotely simple about resolutions. Ultimately, our resolutions come as a result of two things: (1) Reflecting on the year that passed, and realizing we haven’t lived up to our personal expectations; and (2) convincing ourselves that we can measure up, with just a few simple adjustments, starting tomorrow. New Year’s Resolutions are parked at the intersection of Hope and Regret, often up on blocks with the tires stolen. We make them, then break them, then resume our habitual course of conduct until we get a burst of courage at the end of the year. (And, for the record, I’m not sure that anything good can come of making major life decisions while wearing a pointed hat and blowing a kazoo.) We fail, often, because the resolutions become our focus, rather than the underlying issue of who we aren’t but want to be. So, what if we went all 14th century on our resolutions and tried to reduce them to a simpler form? What if we reduced them to the simplest form: A single word? If you could pick one word to describe you–you as you want to be, not as you currently think of yourself–what would it be? Do you want to be HEALTHY? SUCCESSFUL? HAPPY? WISE? COURAGEOUS? LOVED? What is the one thing you really want to be? (I don’t suggest trying something like “TALLER.” Self-improvement has its limits). Perhaps better stated, what is the character trait that you believe would be the difference-maker for you? I think that most of us know what our one thing is, or we at least have some strong suspicions. We go through life like the Tin Man or the Cowardly Lion, certain that if we just had the heart or the nerve nothing would stand in our way. I also happen to believe that each of us already has that character trait for which we pine, even if only in some nascent state, waiting to be drawn from the wings onto center stage. We just need to name it and invite it. So name it, then. Noodle over what that game-changing attribute is for you, then write it down. One word. Then put it everywhere. On your phone and computer screen saver. Go ahead and tape it to that bathroom mirror or hang it from the rear-view mirror of your car. Write it in permanent marker on your spouse’s forehead. Whatever works for you. But simplify your resolution to one word, and then examine and evaluate your daily conduct against that adjective. One of the great truths learned from neuroscience is that “faking it until you make it” actually works. That which we pretend to be, for good or ill, often becomes the reality, especially when it comes to emotions, attitudes and outlook. While we cannot write “RICH” on a Post-It Note and expect someone to drop off sacks of money on our doorstep, we can reasonably expect that if a lack of confidence is hindering our financial success, then by focusing on the idea of confidence and behaving confidently, we can change that aspect of our character and improve our chances for wealth. This year, simplify your self improvement. Name your desired character and invite it to take a central role in your life. Focus less on the “to-do” of standard resolutions and more on the “to become” of a one-word resolution. You and I both know how well our detailed resolutions are working. A one-word resolution is unlikely to be any worse. Why Born to a Carpenter? There is one thing missing from the Bible that has intrigued me for years, especially as I have experienced the blessings and trials of parenthood. That is the lack of any meaningful discussion of Joseph, the husband of Mary and the man chosen by our Father in Heaven to stand as His surrogate in raising His Only Beloved Son. What manner of man must he have been? We know so little. We understand him to have been a kind and just man, based upon his treatment of Mary when he learned of her pregnancy and tried to spare her embarrassment through a private separation. We witness his humility, demonstrated when he accepted the angelic admonition to remain by Mary’s side and trust that this was the work of God. We suppose that he died early in the life of our Savior, as he is completely absent from the narratives of Christ’s ministry. And we know he was a carpenter. 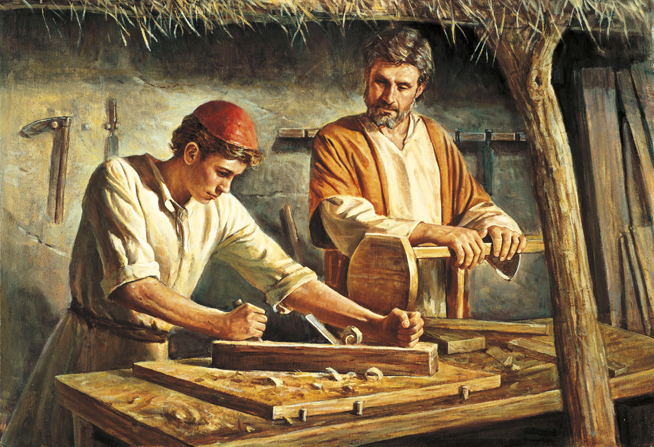 Of all the professions and trades to be plied by the man entrusted to rear the Son of God, why that of a carpenter? Wouldn’t it make more sense for him to have been a priest or rabbi, someone with a heightened understanding of scripture who could help guide and instruct the young Jesus as he grew in his understanding of the gospel? Why, of all things, a worker of wood? Any answer is pure conjecture, but as I have thought about this in recent days, I have come to believe that there might have been no profession more instructive for Jesus in His formative years. My own grandfather was a carpenter, so I have at least a passing familiarity with what they do and how the trade may have provided a perfect environment to raise a Redeemer. I think it may have to do with Christ’s role as the Great Transformer of mankind. Those who work with wood possess a gift that I don’t share, but I envy. Like a sculptor, they can look at the raw material of wood and see within it something that is hidden from the rest of us. Where I might see only a nondescript block of wood, of little value other than to prop open a door or stoke a fire, a gifted carpenter might see a beautiful image of a horse, disguised only by the rough pieces that need to be removed in order to bring out the buried beauty. Or he might see how that piece of wood, properly shaped and employed, can be put to use with other anonymous pieces to create a strong and magnificent structure, creating something that adds up to much more than the sum of its parts. The temple of Solomon was constructed from such pieces of timber, none of which would be remembered for their individual traits, but when brought together would become the stuff of legend. For many of us, He finds the role that we can best play in His great work, something that may seem inconsequential to us, but turns out to be of great worth to someone else. He finds the purpose to which we are perfectly fit, and by doing so constructs His kingdom . Christ redeems us by changing us. From death to life. From the stains of sin to being white as snow. From stubborn fools to devoted disciples. It was in order to make something glorious of each of us that He came to Bethlehem, walked the lands of Galilee, and stretched out in pain in Gethsemane and Golgotha. His work was to take creatures as lowly as us, and through His grace, have us become joint heirs with Him. Perhaps that is why, when the Father looked over the expanse of Earth to find the man to raise His Son, He chose to place Him in a carpenter’s hands.